For those of you who are reading my Manitoba-Made Beef Short Ribs recipe at a distance and want to make them using a similar Korean BBQ sauce that you can easily make at home… please give this a try. 1. In a medium saucepan over high heat, whisk together sugar, soy sauce, water, onion powder, garlic and ginger. 2. Bring to a boil. 3. Reduce heat to a low setting, and simmer at least 5 minutes. 4 Remove the mixture from the heat and cool it for 5 minutes. 5. Whisk in green onions, lemon juice and sriracha. 6. Cool and strain to store in a tightly sealed container in your fridge for up to a month. Or make a triple batch of my Manitoba-Made Beef Short Ribs using all of this sauce! You can probably omit the orange juice in that ribs recipe if you’re using this thinner sauce. This recipe also makes a great marinade for any meat, especially chicken. Enjoy! NOTE: If you find that the consistency is too thin for what you’d like, substitute brown sugar for the white sugar, and simmer the final mixture on low for a couple of hours to reduce it to a more sauce-y texture. You could also take 1/4 cup of your final sauce while it is hot and shake it with 1 tbsp. cornstarch to thicken, then add that mixture back into the whole pot and whisk together. What is your favourite homemade BBQ Sauce recipe? Please feel free to share it in the Comments section below. At this time of year it’s a great idea to have a few last-minute appetizers to pull out of your fridge to wow unexpected guests. These marinated mushrooms are super easy to make, and hold well for 3 to 5 days in the fridge, or can try canning them for a longer-lasting product. 1. Boil a large pot of salted water. 2. Place the mushrooms whole into the boiling water for 7 minutes. I do not recommend washing your mushrooms until just before you are going to cook them – a light washing is fine. I scrub mine 4 at a time in my hands under running water. 2. 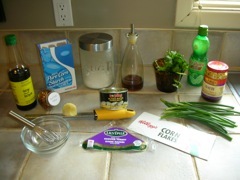 In a small bowl, whisk together olive oil, vinegar, garlic, green onions, soy sauce, red pepper flakes, and sririacha. 3. Once the mushrooms are done boiling, drain them, and place them into a large resealable container. 4. Pour the liquid over the mushrooms, stir together, and cover with the lid. 5. Let your container sit on your kitchen counter to cool. Allow the mushrooms to begin their marinading process at room temperature for a couple of hours. 6. Then you can refrigerate your mushrooms, and use as needed. 7. Create an Antipasto Platter by adding Roasted Red Peppers and Roasted Garlic. Serve the mushrooms with on a platter with room-temperature cheeses, deli meats and crackers or baguette. TIP: The spicy taste is great!!! For a more intense flavour, pull the mushroom stems out of the caps before boiling which will allow the marinade to permeate into the mushroom from the inside. * Diced the marinated mushrooms up and use as a condiment on burgers or beef dip sandwiches. * Mince them up to use as a mushroom tapenade on french bread. * Pop off the stems, and pipe in some soft cheese like Boursin for a fancier appetizer. * They’d be a great accompaniment to any steak. * Excellent choice for use in any salad, especially to dress up a Caesar salad with fresh tomatoes. What do YOU like to have with these mushrooms? Please feel free to share your uses below in the Comments section. turn out perfect every time – ON time! Pre-heat your oven to 350*F.
into 4 cups of lukewarm water. I prefer using a flatter, covered dish like my retro Corning Ware piece. Makes it very easy to put away after it cools too. Stir in 1 teaspoon of salt, and add 1 tablespoon of butter. Bake covered at 350*F for 45 minutes. This makes enough for two people for 3 meals. We eat one, and then I freeze two batches for an easy side later. BTW I love adding a cup of cooked frozen peas to my basmati rice! Last week I was cruising through my local butcher, and saw some packages of beef short ribs. I’d learned previously that my Food Fare (Portage and Mount Royal) only carries Manitoba Beef, so I knew I was getting a great quality product. 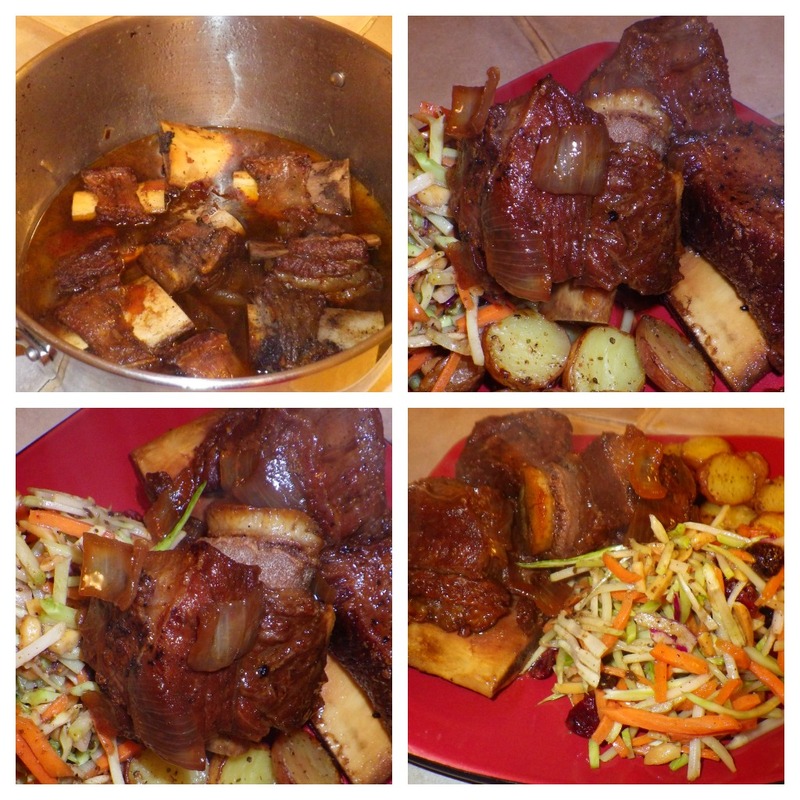 You might ask why I would bother to make Short Ribs for lunch… well I didn’t… I made them for dinner the night before. And wow were the leftovers amazing! So DO make extras when you try this recipe, because, like Lasagna, they are even better the next day! Here’s a really, simple recipe that you can try (especially if you’re living in Manitoba) as it features Bon Vivant! Korean BBQ Sauce – a BIG favourite in our home. I love all of their products, but this one is my #1 choice. n awesome appetizer for a small party. 1. Heat 2 tablespoons of Peanut Oil on High in a deep, Dutch Oven, kind of pot. I prefer to use Peanut Oil for searing as it has a higher smoke point than most cooking oils. But if you’re allergic to nuts, then pick one of these other choices, or use whatever you have on hand. 2. Pat your short ribs dry (on both sides) with a paper towel to remove any excess moisture otherwise it will hamper your ability to get a good sear on the meat. I learned that trick from watching Julie & Julia! 3. Carefully place each rib into your hot oil, but do not crowd the pan. I only put 5 ribs in at a time. 4. Sear the bottom side of the rib for 1 minute, then flip and sear the other side for a minute. It’s okay to cover the pan while searing to avoid oil spatters. 5. Remove the seared ribs to a clean plate, and repeat for remaining ribs until all the ribs have been seared off. 6. For the next step, turn down your stove to medium high, and place your chopped onion and garlic into the oil to cook for 2-3 minutes, stirring often. 7. Pour in a cup of your favourite BBQ sauce, and 1/2 cup of orange juice. 8. Place the ribs on top of the onions so that they sit-up about halfway out of the braising liquid. 9. Cover the pot, and turn down the heat to Medium-Low. Cook at a light bubble for 2 hours. NOTE: Be careful not to over-cook the ribs though… I went a bit beyond the 2 hours, and they were REALLY falling off the bone. 10. Serve with my Oven-Baked Basmati Rice recipe. I also like to mix my veggies right in to the rice before I serve it. Don’t these just make your mouth water? This recipe made 3 portions. Don’t forget to save a bowl of this yummy goodness for your LunchFor1 the next day. You can thank me tomorrow! This recipe is just so tasty that we wanted to make it again already using the homemade sauce. but I’m keen to know how you cook your Short Ribs. Please feel free to leave your recipe details in the Comments section. Thanks to much inspiration from some of my fellow Foodies in Winnipeg I am finally entering the food-blogging world… so here goes my first post! I dedicate this Blog to three very special women in my life. My mother Clarice, and my aunt Ardella, who were both amazing cooks, but who are both unfortunately no longer with us. Thank you both for still inspiring me in the kitchen. AND… my big sister Debra Godin who’s birthday is tomorrow (March 21st) – Happy Birthday Sis! Here’s to another ‘you-know-how-many’ years – CHEERS! 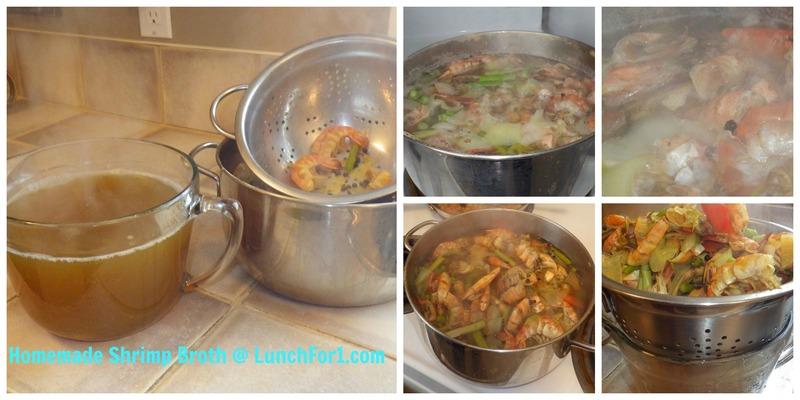 Enjoy this healthy recipe for your collection, and for sharing with our family back in Regina. Why Did I Choose This Recipe? I had originally thought to start off my blog with something simple that everyone seems to love… Roasted Garlic and new way to prepare it. But after making this meatball recipe today it’s won my First Place Ribbon for today, and THIS is what’s for dinner tonight! Enjoy, and please feel free to leave your comments below. are quick and easy to make. OXO Good Grips gelato scoop! Using a Silpat makes cleanup super simple, and this recipe makes 48 mini meatballs. 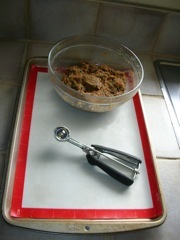 Line two large baking sheets with a Silpat liners or parchment paper. Whisk soy sauce, sesame oil, ginger, red chili flakes and sugar in a large bowl. Whisk in cornstarch until smooth. Stir in two minced green onions, cilantro and water chestnuts. Stir in turkey and corn flake crumbs until completely combined. Refrigerate for an hour to allow ingredients to marinade. 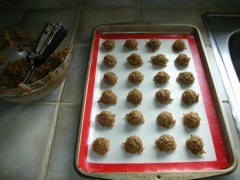 Using a 1″ gelato scoop (or two teaspoons) drop turkey balls on to your baking sheet. Bake for about 12 minutes, or until the meat is cooked through. Test one for doneness by slicing it in half. 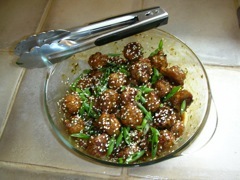 Stir Hoisin sauce, rice wine vinegar, cilantro and lime juice in a large bowl and leave over oven vent or heat slightly in a small pot so that it is warmed when you glaze the meatballs. 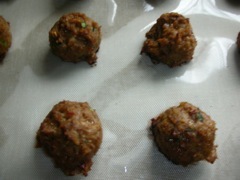 Add the cooked meatballs to the glaze mixture, and gently stir to coat. 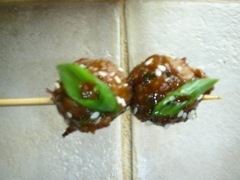 Sprinkle with the bias-cut scallions and sesame seeds and serve hot. Firstly, my super-great husband who eats everything I make, even when my recipes don’t quite turn out as I wished. Jeff, your hungry tummy is my greatest inspiration – I love surprising you by trying new meal ideas. Thank you for sharing all these great meals with me over the past 11+ years both at home, at some of our great local restaurants – here and in our travels. 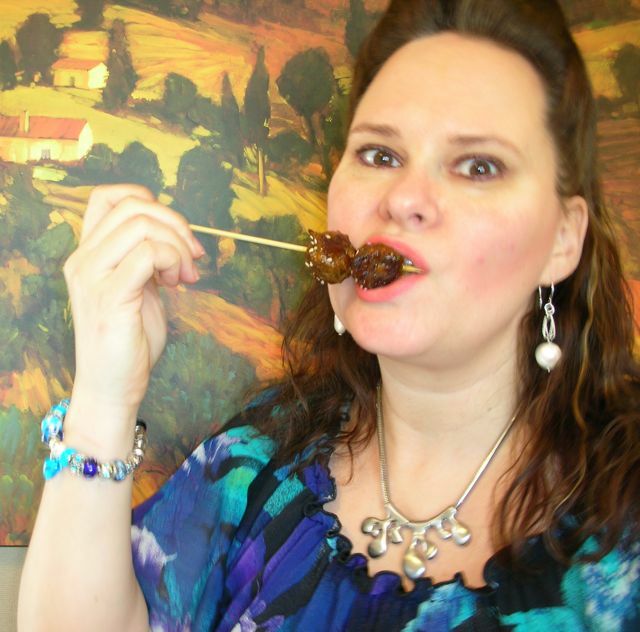 Secondly, thank you to my very best friend, Debbie Bradley – who I love spoiling with food. Thanks for the laughs, and for believing in me. Maybe one day you and I WILL open a special restaurant where we can spoil others! Then again… maybe not… but perhaps I could be talked into running a Gourmet Food Truck – one day. Thirdly, I would also like to thank a new friend and fellow chocoholic – Chocolatier Constance Popp for her words of encouragement. Especially for thinking that I could actually open my own Culinary School. I love dreaming big with you! Lastly, thanks to the members of the Manitoba Food Bloggers Facebook Group for your inspiration, support and guidance to launch this food blog today. I have thoroughly enjoyed following your blogs over the past few months, and I am humbled today to officially join your ranks of great local Foodies. Fresh out of the oven is the best way to enjoy these lil yummy bundles of goodness!